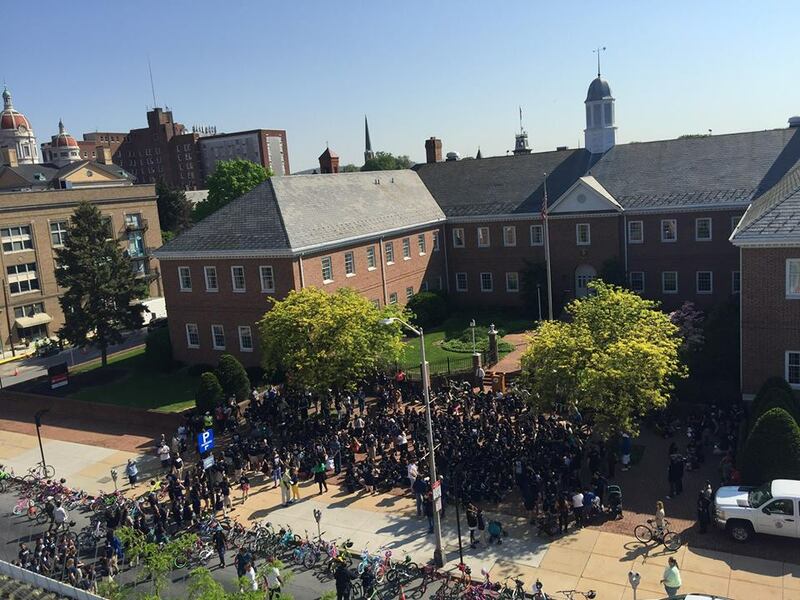 York, Pennsylvania, was recognized as a Silver Bicycle Friendly Community last week. Craig Walt with the York City Bureau of Public Health talks about how the city achieved its bicycle friendly status. With all the excitement about York’s recognition as a Silver Bicycle Friendly Community, it is a time to reflect not only on how far we have come but also why we strive to become bicycle friendly in the first place. In reviewing our past application and researching the efforts that lead to our initial Bronze BFC award in 2014, I was filled with gratitude for the individuals, organizations and partnerships that laid the foundation for York to become a Bicycle Friendly Community. While efforts to officially become more bicycle friendly started almost a decade ago, the forethought of those who pushed for the York County Heritage Rail Trail truly paved the way for biking in York, PA. On top of this, PA Bike Routes S and J converge in Downtown York. The synergy of trails and on-street bike routes was evident in York even before we realized it. Flash forward to 2010 when the YMCA of York and York County was selected to participate in the ACHIEVE Initiative by the Centers for Disease Control and Prevention (CDC) and the YMCA of the USA. ACHIEVE, Action Communities for Health, Innovation and Environmental Change, focuses on improving the health of community members through policy, systems, and environmental changes. The YMCA of York County invited key partners, including the City of York, to join the effort to improve health within York City and hence a new initiative was created, Eat Play Breathe York. A main focus area was to enhance the built environment and increase opportunities for safe, physical activity. Improving walkability and bikeability was identified as a key strategy to promote healthier lifestyles among York City residents. Complete Streets Policy became a priority. Introduced by council resolution in 2011 and implemented as a policy in 2012, Complete Streets became a public health and safety effort and quality of life issue. Shortly thereafter, the City of York and YMCA of York County partnered to implement a CDC grant program called REACH (Racial and Ethnic Approaches to Community Health). The REACH work plan included specific goals and objectives to create a more walkable/bikeable city, with a specific focus on low-income neighborhoods. The City of York utilized Arc-GIS software to identify disparities related to personal vehicle access, access to places for physical activity and recreation, and other social determinants of health, such as income status. This fundamental evaluation and planning work was necessary to ensure that urban revitalization efforts were also benefiting the most vulnerable. Since receiving the Bronze designation in 2014, the City of York has continued the momentum by adding an additional 10.08 lane miles (7.06 centerline miles) to the on-street bike network within our 5.2 square-mile city. We have also installed 58 new high-quality bike racks in public locations throughout the City and several unique artistic bike racks in the historic Market District. In 2016, a one-mile section of the York County Heritage Rail Trail leading to Downtown York was improved through widening, resurfacing and installing LED lighting and wayfinding signage as the trail enters Downtown York. In 2017, York introduced a public bike share program in partnership with Zagster and developed the Bike York pocket brochure detailing our marked bike routes and parking locations, safe riding messages, and information about public bike share to promote these great amenities to residents and visitors. We know that without education and encouragement efforts, improvements to the built environment may not be fully utilized or embraced. Therefore, promotional and educational efforts were increased in partnership with Bike York, Recycle Bicycle (based in Harrisburg, PA), local bike shops, and bicycle advocates. In line with Bicycle Friendly America, our Active Transportation Committee supported four businesses in receiving designation as Bicycle Friendly Businesses and hosted a Regional Bike Summit in partnership with Bicycle South Central PA to support neighboring communities in pursuing Bicycle Friendly Community designation. Our 2014 Bronze BFC Award and Feedback Report absolutely set the stage for all of this to unfold in our pursuit of Silver. Looking forward, our community anticipates a monumental project that will connect the existing 21 miles of the York County Heritage Rail Trail to the Northern Extension of the Rail Trail, creating a continuous 27 miles of trailway and shared-use paths weaving through rural southern York County, travelling into historic Downtown York, and continuing north along the Codorus Creek to John C. Rudy Park. Additionally, the City of York plans to implement a two-way cycle track on a 1.6 mile stretch of the King Street Bikeway. 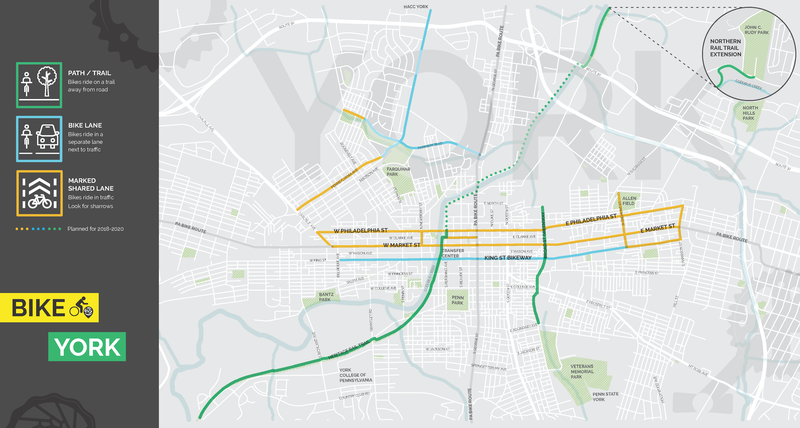 This improvement will provide eastbound and westbound travel, greatly improving connectivity and accessibility as it intersects with the York County Heritage Rail Trail directly adjacent to the rabbittransit Downtown Transfer Center. This site, also serving as the flagship bike share location and a new public bike repair station, has been transformed into a multimodal hub by no accident. Collaboration and collective effort has led bicycling to become embraced by various sectors in our community including transportation, health, community and economic development, municipal planning, recreation and tourism. We are seeing the inclusion of bicycle friendly perspectives and accommodations across these sectors and are quickly seeing visible changes in our community. This is increasing the local bicycle culture and moving it into the mainstream among the community at large. For example, rabbittransit’s Pedal. Hop. Pedal. program which includes exterior bike racks on all fixed route buses has seen the amount of bicycle commuters using this feature more than double since 2012. Additionally, we anticipate our Zagster Bike Share program will exceed our annual membership and ridership goals by the end of the summer. This program will be expanding later this year through community funding partnerships. 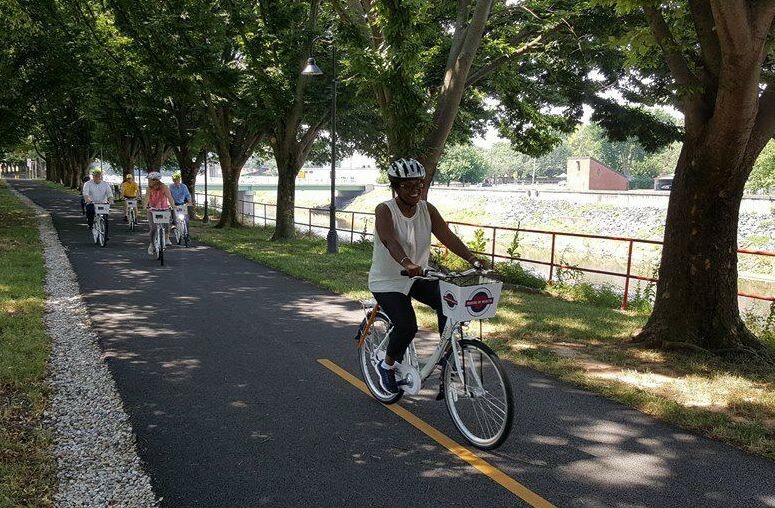 Bicycling in York, PA is about public health and safety, quality of life and cultivating a vibrant and socially connected community. This is about creating opportunities for residents to be physically active and healthy, to be safe when commuting to work and school, and to simply enjoy the benefits of having bicycling be a part of their lifestyle. The same can be said for visitors who we invite to explore Downtown York and the beautiful countryside of York County on two wheels and wind in their face. With all that said just remember two words: BIKE YORK! Craig Walt, MPH, is Community Health Services Supervisor with the York City Bureau of Health.